Stanchion Masters has designed and manufactures a rugged powder coated steel adapter that fits 2.5″ square posts. 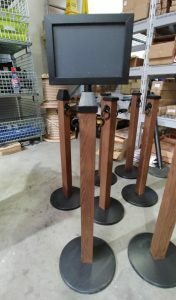 *This adapter allows you to add a sign holder to the top of your 2.5″ square wood or metal stanchion or yous 2-1/2 square wood or aluminum fence post. If you plan to or have previously purchased Tensabarrier 307 Hitching Post wood stanchions or Stanchion Masters outdoor rustic wood or metal stanchions and you need signage on one or more your posts, this adapter is what you need. *Installation required. May require drilling new holes in the top sides of your current stanchion(s) or fence post(s). OUTDOOR USE: The top of the sign frames are open as that is where your display media is inserted. These sign frames are fine for outdoor use when the weather is nice. If you are in a location where it rains a lot or where the stanchions are left outside all the time or often, you should have a local sign company make corrugated plastic media or sintra inserts that are water resistant.